Sara Sailor came to our company and proposed a project for pickleball paddles. 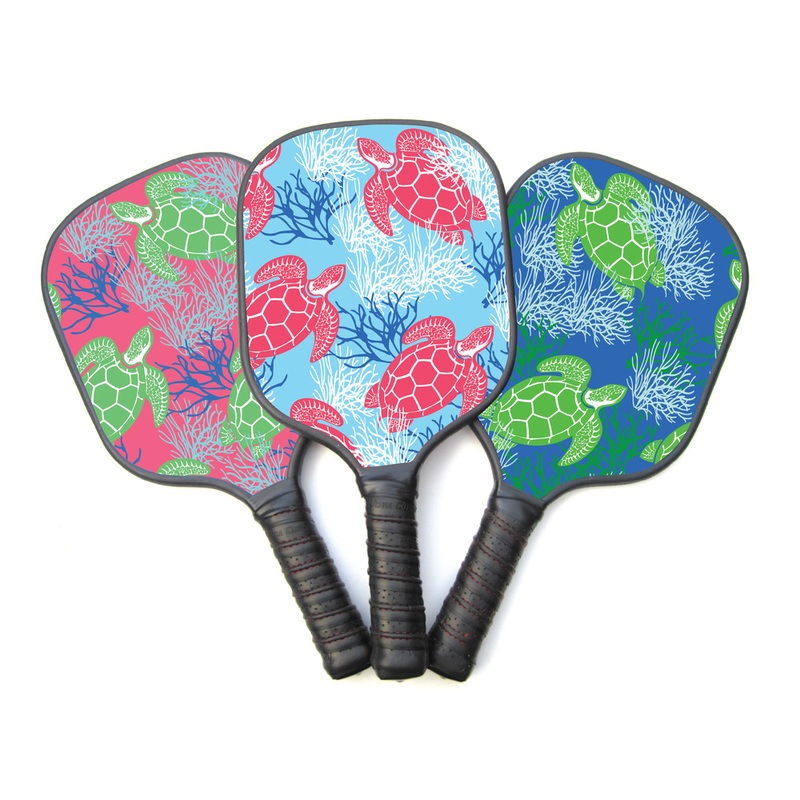 The challenge was to create a retail line of three different pattern designs with a cohesive theme for pickleball paddles. Sara desired a final product that would bring something new and exciting to the pickle ball paddle market. Most pickleball paddles only have company logos or sponsors printed on them. There are not many paddles that are personalized, with interesting designs. When she came to us Sara already had some ideas on the design features and style references she wanted to use. Sara was inspired by bright colors and the coastal lifestyle, taking notes from the classic preppy styling of Vineyard Vines and Lilly Pulitzer. Our first task was researching the items that our client wanted to be featured in the designs. The desired designs varied greatly, ranging from simple ocean coral to colorful swimming pigs. As a two-person design team, one problem we faced was maintaining a consistent design style between the two designers. Lots of shared sketches, sample patterns, color palettes, and mock-ups led us to our final concepts. Our final solutions had three distinct illustrative styles, but still maintained the appeal and visual cohesion of a single unit. Each paddle had a color palette that was robust and distinct, yet functioned well as part of the group aesthetic. The final designs were produced in vinyl material and placed on the pickleball paddle to complete production. These custom pickleball paddle designs are now part of a line that Sara plans to sell to the pickleball-playing community.